Which is the best bet for the 2016 Memsie Stakes at Caulfield? Racing Online - Tips - Which is the best bet for the 2016 Memsie Stakes at Caulfield? 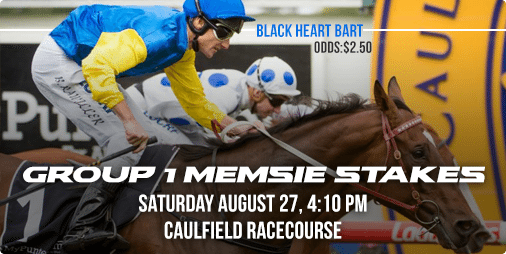 SPRING racing kicks off this Saturday at Caulfield with the Group 1 Memsie Stakes and we have free tips, updated odds and form for all nine races on the card. The Memsie Stakes market is being dominated by champion trainer Darren Weir who has the first three favourites in the race and that doesn’t include 2015 Melbourne Cup-winner Prince Of Penzance. Black Heart Bart has taken most of the action with bookmakers, but stablemates Mahuta and Palentino are firmly in punters sights. We have free tips for the nine-race card and punters can get up to $50 in bonus bets on races 4, 5 and 6 at Caulfield with Sportsbet.com.au on Saturday. Sebrikka was an impressive winner last start when bursting through runners and it has been well backed since markets opened. The Hayes/Dabernig-trained filly opened at $3.30 and is currently at $3, and the apprentice claim of Regan Bayliss will help. Looks a strong winning chance. Leotie was an eye-catcher last start when flashing home for second behind I Am A Star. The Henry Dwyer-trained filly produced one of the best finishes of the day and it looked good winning its maiden prior to that. The daughter of Darci Brahma has drawn favourably in barrier two and the $2.20 is a respectable price. Perfectly Safe is on the third line of betting at $5 following a last start second placing behind Hot Doc. The Hayes/Dabernig-trained filly looked the goods when winning at Sandown at its third start and top jockey Dwayne Dunn takes the ride. Tough to beat the two favourites, but consider for each way bets. Prince Of Brooklyn broke through for the overdue win last start at Caulfield, but it’s a drifting favourite for this. The four-year-old for Mick Price drops right down in weight for this at 54kg with Damien Oliver in the saddle, but after opening at $2.40 it now sits at $2.70. He’s Our Rokki has been specked in the market as the second favourite. The four-year-old has won three of its last four starts and is fresh up for this. It usually finds its best form quickly and despite having won last start at 2000m, the 1400m looks an ideal target and punters have come for it. The John O’Shea-trained Tarquin ran 11th in the SA Derby last time out, but it has been well backed for this. The Hard Spun gelding goes well fresh and it currently sits at $5 after opening at $5.50. It mixes its form which can frustrate punters, but carrying only 52.5kg will help and it could run a nice race fresh up. Majestic Lass is the current $4.40 favourite in a wide-open race. The Hayes/Dabernig-trained mare won back-to-back races to kick off this campaign and it wasn’t disgraced when fourth last time out. This is tougher here, but it runs well at Caulfield and Michael Walker takes the ride down at 54kg. Daniela Rosa is a smart mare for Michael Moroney which had every chance to win last start, but found the going too tough. The four-year-old had won its prior two races which included the Rivette Final at Flemington and that form should stack up nicely for this. It has drawn well and is down in the weights so consider at an each way price of $5.50. She’s Clean is a class runner of the field, but it needs to find its best again. The eight-year-old mare has won 10 from 47 starts and was treading water for a few seasons, but its last start placing at Flemington was encouraging. The Chris Waller-trained runner ran third behind Ulmann and if it can replicate that effort, it could score a rare win at odds of $9. Camdus showed its class when winning at Flemington last start and it continues to be underrated by bookmakers. The Darren Weir-trained gelding won paying $9 last start and is currently $6 for this. It is a four-time winner from nine starts and three wins have come at this distance. The wide draw doesn’t help, but it should seek the pace and kick strongly. John O’Shea lines up Badajoz which went close behind Camdus last start and it carries 1.5kg less than Camdus here. The four-year-old has been producing solid runs all season and is rarely out of punters sights. It opened at $3.70 and has been supported into $3.60. We expect that price to continue to drop. Black Vanquish is a two-win gelding for Tom Hughes which has been specked at each way odds of $8.50. The four-year-old indicated its ability by winning at Caulfield five starts back and it has subsequently started in the Group 1 Coolmore Stud Stakes, but it’s had its fair share of problems and punters will need to take it on trust. Follow any positive betting moves. Hellbent was too good for them last start when winning at Sandown. The Darren Weir-trained horse dropped right back in grade for the win and took advantage. Its efforts prior included a win in the Inglis Dash at Flemington and a second placing in the Inglis Sprint behind Lady Sniper at Randwick. This is a quality field, but the $6 is a good price. Under The Louvre finally scored its first group one win last start in the Stradbroke Handicap. The Robert Smerdon-trained horse finished over the top of Black Heart Bart which is contesting the Group 1 Memsie Stakes later on the card. This is an easier target and it goes well in a fresh up state. Expect jockey Nick Hall to pull it back from the wide barrier draw and fly home late. Current $2.80 favourite. Redzel resumed in the July Sprint at Canterbury and it won well. The Snowden-trained gelding has plenty of flat pace and punters should expect it to cross from the wide barrier of 12. It’s a three-time winner at this distance and it could give them something to catch at odds of $6. Seaburge is a classy three-year-old for the Hayes/Dabernig stables which has the ability to sprint fresh. The son of Sebring won on debut at Pakenham before finishing second behind the talented Revolving Door and later winning the VRC Sires’ at Flemington. It couldn’t get past Yankee Rose in the Sires Produce at Randwick, but it ran on well and a big campaign is expected. Not an easy resumption, but $6.50 is a nice price. Defcon goes quick as it demonstrated in the Black Opal Stakes at Canberra. The Snowden-trained colt was experience in behind the likes of Tessera and Astern, but was disappointing in the Group 1 Golden Slipper when it finished 13th. It’s another which has big expectations placed on its this campaign and $5.50 suggests a nice run should come on Saturday. Highland Beat pushed Russian Revolution close last start and it arguably should have won. The three-year-old colt was stuck in traffic last start in the Vain Stakes and it has always shown the ability to win a big race. This will be its seventh start at Caulfield where it has had four placings and it should run well at odds of $5. Palentino resumed with a nice run for fourth in the Regal Roller Stakes on this track and it doesn’t take long to find its best form. The Darren Weir-trained horse won the Group 1 Australian Guineas over Tarzino three starts back and it should be in for a big spring campaign. There’s no reason it can’t take this out and the $6.50 is a nice each way price being offered by bookmakers. Stablemate Black Heart Bart has been the best-backed runner in the field at $2.50. The 12-time winner opened at $2.70 and that price was quickly taken for the gelding which finished second behind Under The Louvre in the Group 1 Stradbroke Handicap last start. It has been given a freshen up and having already won at group one level this year, it will be very tough to beat. Another Weir-trained runner is Mahuta which is on the second line of betting at $6.50. The professional horse has won six from 11 and although it pulled up lame after running sixth last start, it has overcome that issue and it should be tough to beat here. It likes to go forward and jockey John Allen might try pinch a gap around the turn. Tom Melbourne resumes for the Freedman stables after pulling up lame in the Mornington Cup last start. The six-year-old import had won three consecutive races prior to that disappointment and those wins came very easily. It has won twice when fresh up so finding form early isn’t a worry and the distance looks ideal. Tough to beat at $4.40 after opening at $4.80. Provocative burst onto the scene when it won the Group 1 Queensland Oaks at Eagle Farm last start. The Tony Pike-trained New Zealander defeated the highly-touted Ambience by three lengths and although this is a steep drop back in distance, it has ability over all distances. $6 being offered suggests a nice resumption is expected. Magnapal finished eighth in the P.B. Lawrence Stakes last start, but it should have finished much closer. The seven-year-old was coming nicely before being shut out at the 100m mark. The Naturalism winner from last September has plenty of ability and it has had two runs this preparation to get fit. Not the worst at $6.50. Mossin’ Around was nicely backed to win last start, but apprentice jockey Ben Allen didn’t give it much of a chance. The Grahame Begg-trained mare was blocked for most of the straight as subsequent winner Ocean Embers had a clear run down the outside. Mossin’ Around is a quality runner which will enjoy the soft track conditions based on its breeding. Good each way bet at $9. Ocean Embers must be respected after its last start win and bookmakers have opened it up as the $5 favourite. The Shea Eden-trained mare will likely have to flash home late again to win this as it has drawn barrier 15. The four-year-old is unbeaten in two starts at Caulfield and although this is a quality field, it has a great chance of going back-to-back. Don’t Doubt Mamma has won and placed fresh up and it showed some class last campaign. The four-year-old is a winner of five races which includes the Vanity Stakes at Flemington and also the Redelva Stakes at Morphettville. A good run at odds of $9 wouldn’t surprise.